Sunny new Millennium Library park, open and waiting! Back in 2009 and 2010, staff at Millennium Library had a different name for the summer months: we jokingly called it “Jackhammer season.” The laborious deconstruction of the 37-year old Centennial Library park necessitated a couple of years’ worth of *painstakingly* precise jackhammering so that the roof of the underground parkade could be repaired. We gamely and happily lived with the noise, though, because we knew the end result would be worth it: a shiny new park with improved sightlines, better lighting, imaginative public art installations and multi-season functionality designed to make the park into a community meeting space. Now, after several years of anticipation, the wait is up! Although some of it is still under construction, large portions of the Millennium Library park are now completed and open to the public. 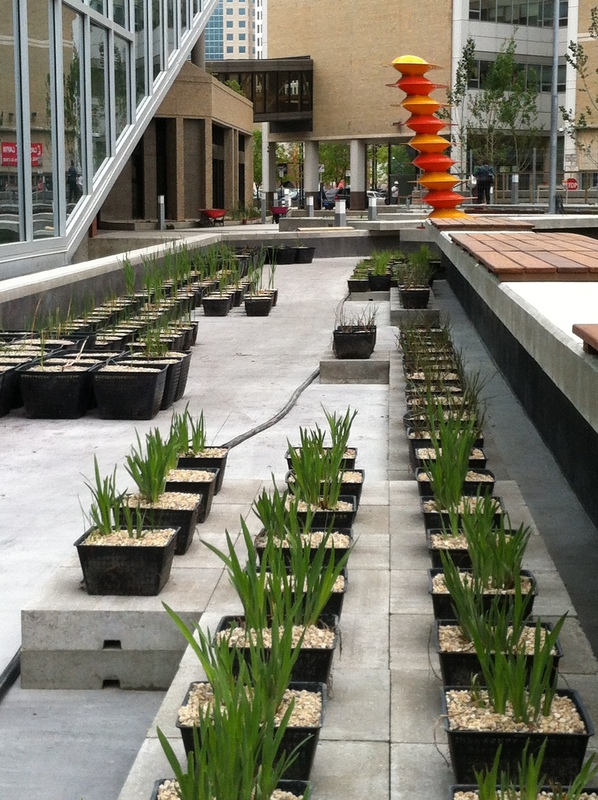 The water feature that runs along the foot of the four-storey window wall was filled with water last week, just a few days after the installation of several truckloads worth of native marsh grasses which, when full-grown, will make our little park into an urban wetland. According to the landscape architects’ planting plan, the water feature will be home to species of softstem bullrush, water arrum, common cattail, yellow pond lily, blue flag iris, needle spike rush, water sedge, and common reed grass. The water feature is aerated by two chrome windmills, which spin (sometimes idly, sometimes madly) in the wind, pushing bubbles up through the tubes that run the length of the pond. If you’re looking for a zen moment, come down and watch the random patterns of bubbles among the reeds – we all agree it’s better than a lava lamp! The one thing we were all saddest to see go when the old park came down were the stands of mature trees that lined the edges of the space; they provided gorgeous dappled shade on the hottest days and turned wonderful colours in the fall. The first year after their removal was a shock to the system. 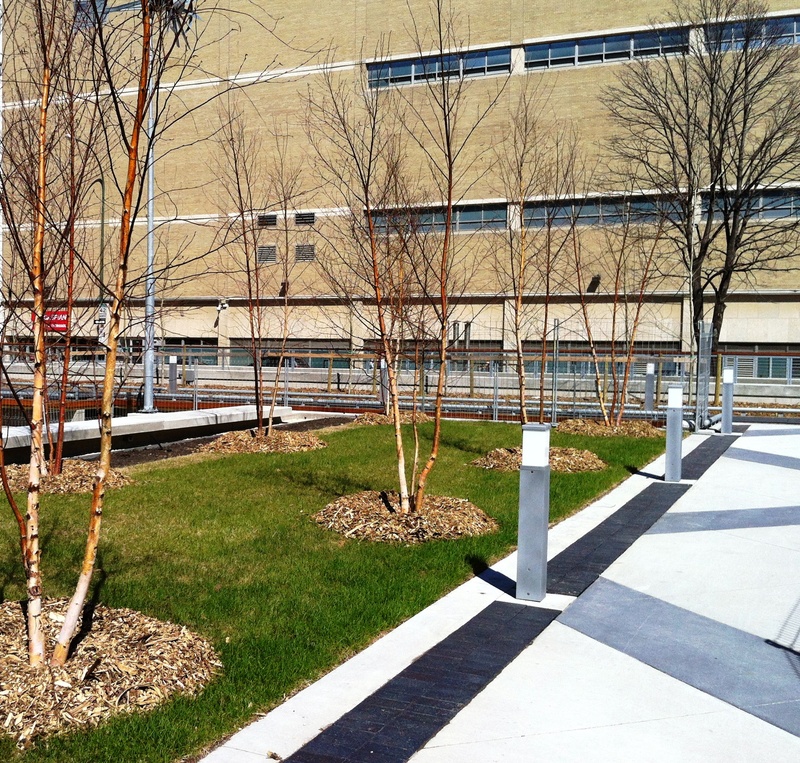 But trees do have a lifespan, especially trees that are growing on top of an artificial surface like our parkade roof. And now, with the new park nearing completion, the trees have returned (if perhaps slightly smaller in stature)! Looking at the new saplings that have been planted around the park (specifically, six american elms, three basswoods, nine paper birch and 19 trembling aspen) it’s almost impossible to picture them as full-grown, mature trees. But if you compare the current plantings to photographs of the Centennial Library park around the time it was built, the similarities are amazing! 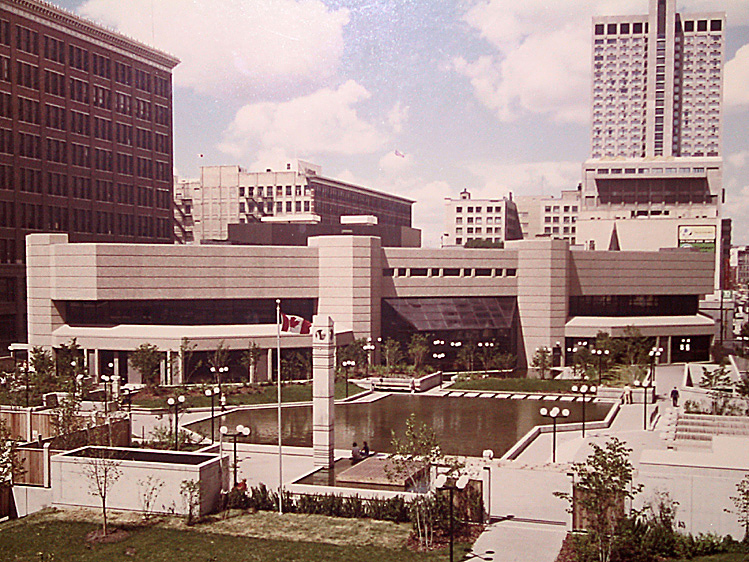 The old Centennial Library park, circa opening (1977). The trees may be small now, but they will grow – it just takes time. In 30 years, the next generation of library users won’t even remember a time when there weren’t sky-scraping elms dotting the park. While the trees, wetlands and sections of prairie grasses/shrubs have all been laid in place, other portions of the park are still under construction. 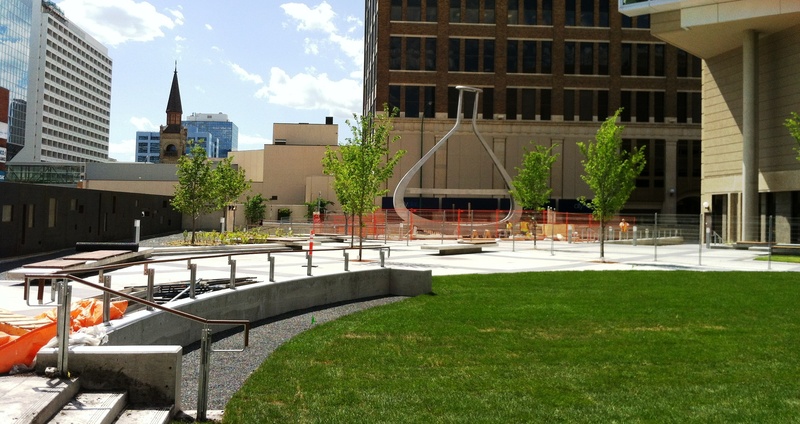 This weekend, workers laid the last of the sod in the grassy areas, finishing off a gorgeous communal picnicking area around the birch trees and also the central oval ampitheatre. Work also continues on the base of “emptyful,” the huge public art/lighting installation which now dominates the west side of the park, lit up with mist and colored lights at night and striking a bold outline against the blue sky by day. 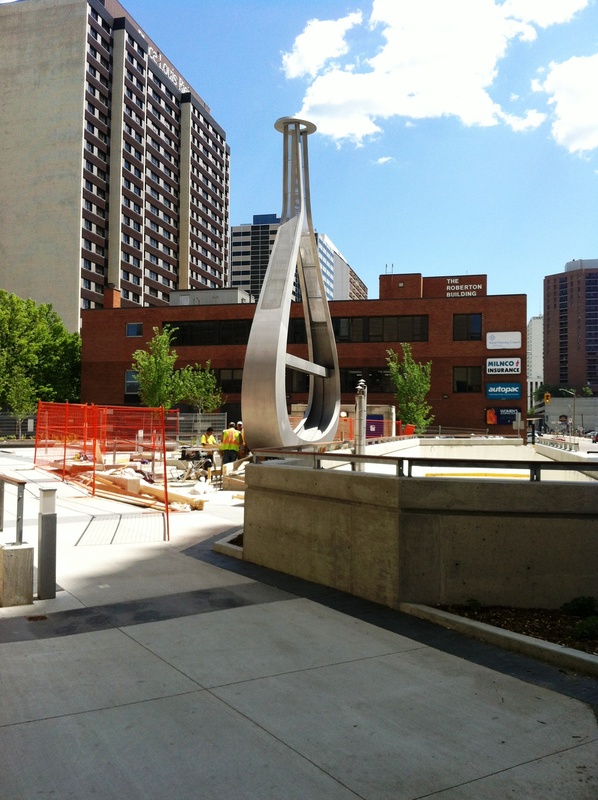 You can read more about this impressive public art piece in today’s Winnipeg Free Press article. And there are of course other areas of the park that have yet to be completed; the park was planned in two stages, the first being what we’re enjoying now, and the second coming at a later date once funding targets are met. The Winnipeg Library Foundation’s project page outlines the vision of the project, and provides links to sites where donations can be made to the park project. One unique way to make a contribution to the park is to donate a piece of the furniture that will eventually dot the landscape; check out the Downtown Biz page for more details on how you can sponsor of the park’s loungers, patio tables or bike racks – you can put your name (or the name of a loved one) on a piece of the new park! For anyone interested in more details about the park and future developments, you can check out the one-page Millennium Library Park Master Plan or the much more detailed Millennium Library Park plan from Hilderman Thomas Frank Cram Landscape Architecture, both of which are posted in pdf form for anyone to download. It’s interesting to see the original plan and compare it to changes that have come over time – nothing ever ends up exactly as planned! Of course, if you do come down for a visit, remember to bring along a hat and some sunscreen! We’ve been spending our lunch hours out in the park, taking in the open sunny spaces, lounging on the benches along the water feature, and the temptation is to spend far too long basking in the sun, which can be dangerous if you don’t have proper protection! The death and life of great American cities / Jane Jacobs; with a new introduction by Jason Epstein and a foreword by the author. A classic of the genre, updated for its 50th anniversary. This entry was posted in Miscellaneous and tagged environmental design, landscape architecture, Millennium Library, parks, renovations, Sophie @ WPL, urban wetlands. Bookmark the permalink. Excellent, informative article Sophie. Kudos and thanks for all the detailed info.